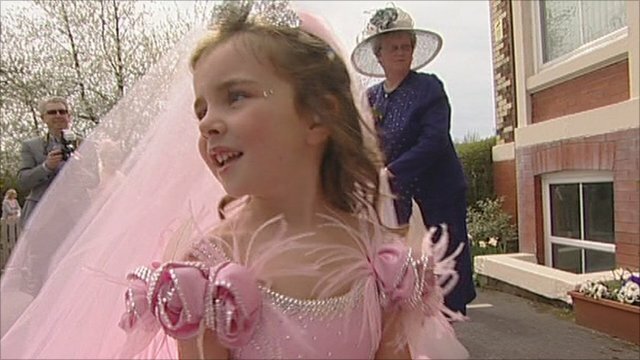 Children at a school in Lancashire celebrated the forthcoming marriage of Prince William and Kate Middleton by staging their own "wedding", inspired by the TV series My Big Fat Gypsy Wedding. The students from Mount Carmel School in Ormskirk designed their own outfits, which were then made by Thelma Madine, one of the dressmakers from the Channel 4 series. The children, aged between four and 11, even invited the royal couple. "We had a reply saying they were a little busy with their own plans but wished us all the best, which was lovely," said head teacher Janet Yardley. "It's an idea that has really spiralled and all the children are so excited."